Whiteheads are a form of acne vulgaris, a very common skin problem these days. Excess sebum or body's natural oil combine with dead skin cells and clog hair follicles, resulting in whiteheads. Whiteheads appear as tiny white bumps or spots and they generally throng the areas where the skin is delicate. Usually sides of nose, under eyes, temples, cheeks and foreheads are areas where whiteheads occur in plenty. Whiteheads generally lie just below the skin. 1. Rub skin with the inner side of lemon peel. This removes whiteheads. 2. Mix some vinegar and cornstarch to make a paste. Apply the paste on affected regions and keep for 30 minutes. Then wash off with warm water. This is an effective home remedy for whiteheads. 3. Mix sandalwood powder and rose water to make a paste. Apply the paste on affected regions and keep for 20 minutes. Then wash with warm water. This helps to remove whiteheads. 4. Application of poultice made of grated potato on skin relieves whitehead problem. 5. Grind fenugreek leaves with water to make a paste. Apply the pate on skin and keep overnight. Next morning, wash off with warm water. 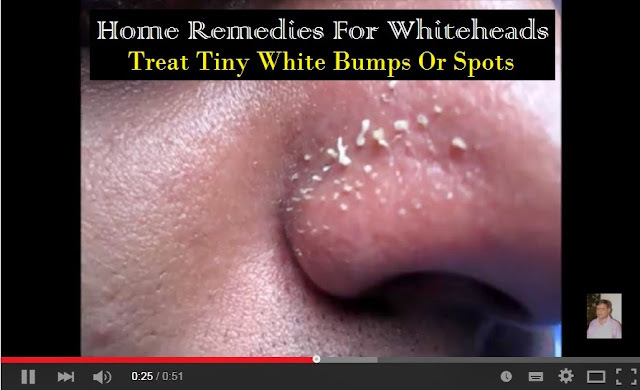 This is highly beneficial in treating whiteheads problem. 6. Combine 1 tablespoon lime juice and 1 tablespoon groundnut oil. Apply the mixture on skin and keep for sometime. This removes the whiteheads. 7. Steam your face for 10 minutes. This opens up clogged skin pores and allows easy removal. 8. Mix 2 teaspoon lime juice, 50 ml raw milk and a pinch of salt. Use the mixture to cleanse pores of whiteheads. 9. Roast and grind pomegranate skin to a powder. Mix the powder with some lime juice to make a paste. Apply the paste on the affected areas. Do this daily to get rid of whiteheads. 10. Splash face with Epsom salt mixed lukewarm water many times during the day. This treats whiteheads effectively. 11. Increase your fluid intake and consume fiber rich diet. 13. Curb the consumption of junk food, caffeine and alcohol.